One hundred years in one hundred stories, American Decameron defines the 20th century. From the award-winning and highly acclaimed author of Ella Minnow Pea comes Mark Dunn's most ambitious novel to date. American Decameron tells one hundred stories, each taking place in a different year of the 20th century. A girl in Galveston is born on the eve of a great storm and the dawn of the 20th century. Survivors of the Lusitania are accidentally reunited in the North Atlantic. A member of the Bonus Army find himself face to face with General MacArthur. A failed writer attempts to end his life on the Golden Gate Bridge until an unexpected heroine comes to his rescue, and on the doorstep of a new millennium, as the clock strikes twelve, the stage is set for a stunning denouement as the American century converges upon itself in a Greenwich nursing home, tying together all of the previous tales and the last one hundred years. Zany and affecting, deeply moving and wildly hilarious, American Decameron is one America's most powerful voices at the top its game. 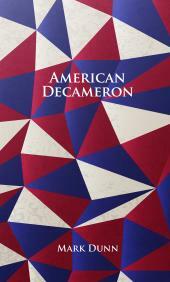 Like the American Decameron Facebook Page for news and reviews about the books.